Photo courtesy of Madison Gurnick. Something for every North Korean kiddie. The guards are a bunch of pussies! Be good kids or you get 7 days in The Box! I’ll stick withToy Story. At least they give you a Woody and a Buzz. Harsh! Maw would just put us in the closet for an hour. Everybody knows that the PAWs control the media and the banks. Crikey they even have snowy German Xmas trees on the freakin’ package! This only happens in China where dogs and cats are put in gas chambers and cooked as meals. I wouldn’t make a Korea out of this. @BFC 1328. Do you have something against Cat Suey, or Peking dog? I guess Bitler the dog would be into this. I have no problem with Cat Suey and Peking Dogs if they are made in USA? The Deluxe Version comes with a small gas oven, just big enough for one average size doll. So you can provide the FINAL SOLUTION to your sister’s dolls cluttering up the house. @Marum: For a doll? That would be the VINYL solution. 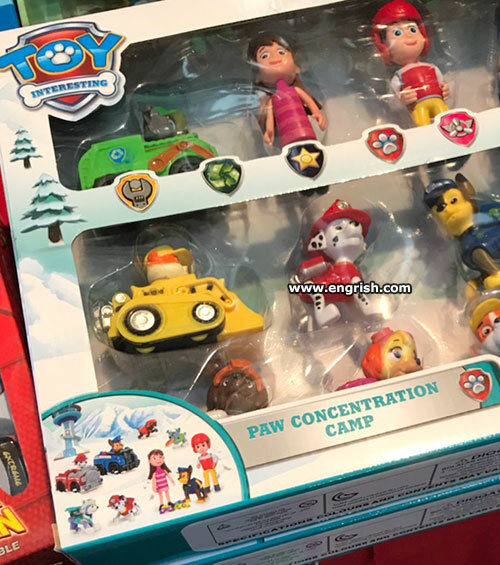 “Concentration” camp – a drug free cure for ADD? If you stick that little electric probe, (the doll on the top right is carrying) up the date of any of the dolls, they will scream until the batteries run out. Ah, salted butterflies are extra.